Boxcutters, Teaspoons, Jigger, Muddler, Shaker Classic/Boston, Strainer, Wine Glass. In a cocktail shaker, muddle the lemon wedges and mint leaves. Add ice and the whiskey, Bitters and Simple Syrup and shake well. Pour through a fine strainer into a double rocks glass or wineglass filled with ice cubes or crushed ice. 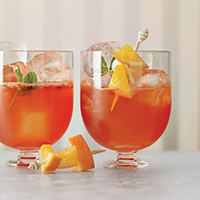 Garnish with the mint sprig and skewered orange wedges.